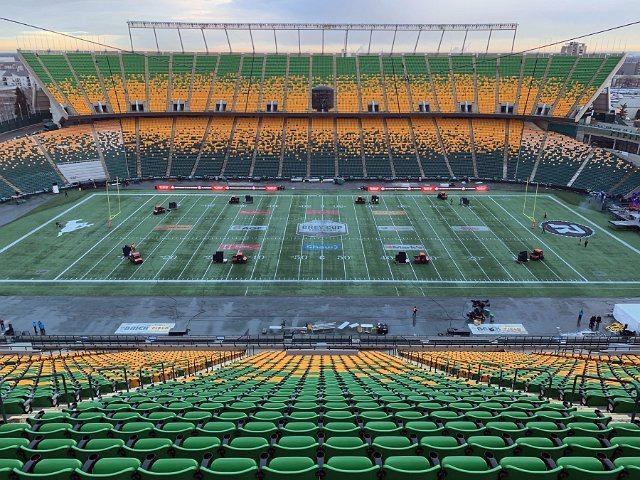 While fans in the stands of the largest open-air stadium in Canada (seating capacity of 55,819) saw a great game, they also heard from some fantastic entertainment. Brother-sister country duo The Reklaws got the audience fired up during the pre-kick-off show, and then Canadian songbird and Grammy Award-winner Alessia Cara rocked the half-time show. FM Systems ensured that all sounded fantastic thanks to a uniquely deployed L-Acoustics K1 sound system, loaded on custom-fabricated carts that were brought onto the field for the performances, and then wheeled out during gameplay. Each of the eight carts was loaded with five K1 enclosures, with a KS28 subwoofer placed vertically next to the K1 stack. These carts were towed into place for the opening and halftime entertainment events, four per side, along the venue’s sidelines. Each cart was connected to one L-Acoustics LA12X-loaded LA-RAK II amplifier rack via a multipin connector. Control and signal distribution were handled at front-of-house by the L-Acoustics P1 processor, controlled through L-Acoustics Network Manager software. Signal to the amplifier racks was distributed to each side of the field via AVB over fiber. Two Luminex GigaCore10 switches at front-of-house accepted AVB from the P1 processor and sent the audio to two additional GigaCore10 switches on each sideline to drive all of the LA-RAK II. Both the P1 and LA12X accept AVB natively, so there were no extra conversions needed.